Unlimited Water Processing provides natural spring water solutions. 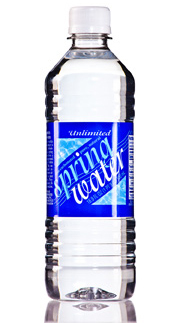 Natural spring water has become very popular among our customers. We process natural spring water from a certified spring. Unlimited Water utlitizes dedicated tank trucks to transport the spring water to our plant facilities for processing. After processing is complete, we package our own refillable 5 gallon bottles and small bottled water containers. To order, please contact customer service.